Upon arriving home from work on Thursday, I went through the usual ritual -- came in the front door, put my purse and keys on the dining table, then joined the dogs and cats at the sliding door to the back yard. Knowing that the chickens were out in their yard, I had Ulani by her collar getting ready to hook her to her tie-out until the chickens went back in the barn. Because when I opened the door, Oskar sprang outside and immediately slammed the brakes and looked intently to his left -- at the snake holding a toad in the grass. Yup. I pushed Ulani back in the house and stepped out myself. Oskar demonstrated some curiosity, but also a strong portion of self control. I did not worry about what he would do. My snow shovel is still outside the back door (hey, it's only mid-April here, there's a good chance we'll get another snowfall!). 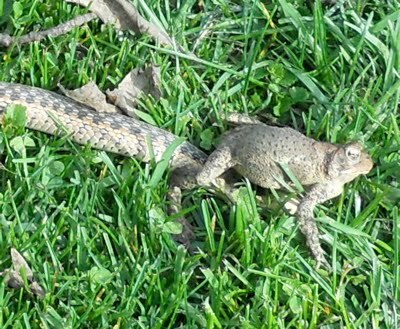 I took it and started nudging the snake, just enough to irritate him, and sure enough he opened his mouth and turned his head towards the shovel allowing the toad to hop a few feet away. The toad's left arm was pretty bloody, but it seemed to work and after taking a moment, he hopped under the gate and onto the driveway. 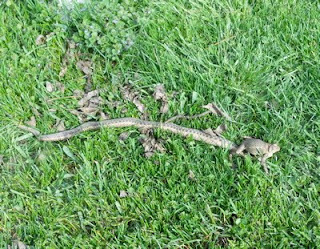 I turned back to the snake and nudged him again, and he slithered into the untrimmed grass around a downspout, disappearing. And then I let Ulani and the cats out. They were only modestly interested in the scene of the crime. Five minutes later you'd never know anything out of the ordinary had occurred on this Thursday after work here at Busy Solitude Farm. 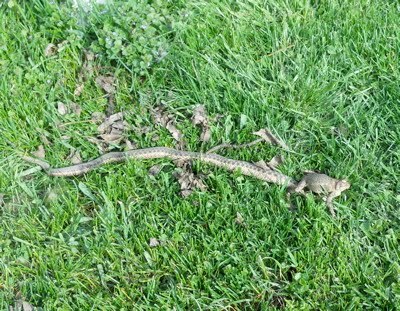 You were nicer to the snake than I probably would have been. Unless it's a king snake or black runner. They usually don't make it out alive. This is why I live on the 24th floor.